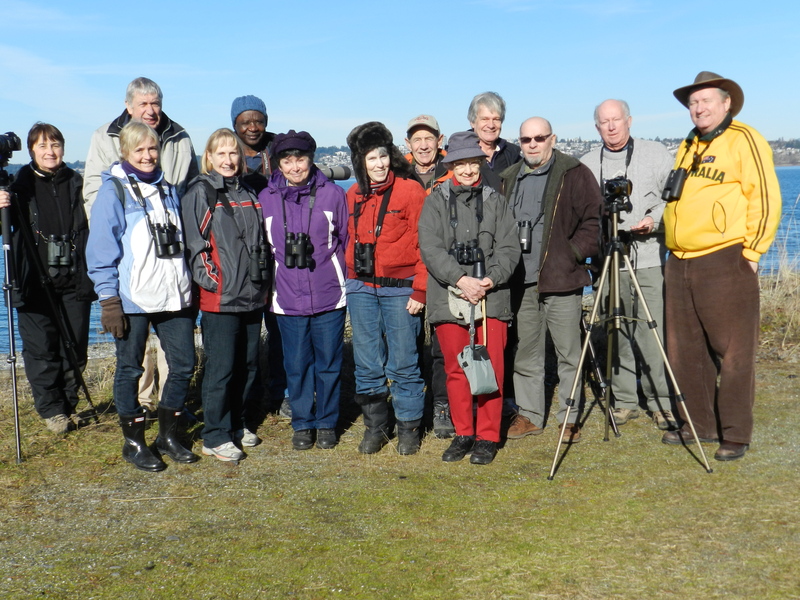 On a gorgeous Monday morning, thirteen birders (White Rock Al, Anne M, Eleanor, Lorna, John Mc, Jon & Lorraine, Ken & Anne and newbie Ken G, Leona, Roger and me) participated in our “international” outing to Drayton Harbour and Semiahmoo Bay in Blaine Wa. USA. Our target birds were pelagic species that we do not see often north of the border. Hi-lites included: three Loon species (Common, Pacific and Red-throated), Pigeon Guillemots, Long-tailed Ducks, three Grebe species (Horned, Red-necked and one Eared), both Common and Barrow’s Goldeneye, Bufflehead, Red-breasted Mergansers, Lesser and Greater Scaup, Canvasbacks, Brant Geese, Pelagic and Double-crested Cormorants, Dunlin, Sanderling, Lesser Yellowlegs, Peregrine Falcon, Belted Kingfisher, huge rafts of Northern Pintails, plus lots of other “common/regular” stuff. The vistas back to White Rock and the mountains, including Mount Baker were stunning. Many of these birds posed nicely for our photogs, so there should be some nice shots soon on our DNCB Picasa site. Our outing was a bit discombobulated as one (I wonder who?) of our drivers got lost from the group on a number of occasions. But the peanuts, and Lorna’s egg AND PB sandwiches seemed to calm the edginess. Next Monday, Feb 13, Roger Meyer will meet the group at Petra’s for departure at 8:00 a.m. on a local outing, likely around Ladner and to Reifel. Don’t forget our Delta Nats monthly meeting that evening (Feb. 13) at 7:30 p.m. at Cammidge House where Dan Esler will speak on Wildlife Responses to the Exxon Valdez Oil Spill. Sandra and I leave tomorrow morning (Feb. 7) for Ontario to visit friends and relatives in Brampton, Dorset and Niagara Falls, returning on Feb 21. I am hopeful that some of today’s participants will elaborate on this Abbreviated (and uncharacteristically boring) Report, and Roger will put it on our Blog. Comments encouraged. This entry was posted in *DNCB, Blaine, Blaine Marine Park, Drayton Harbor, Semiahmoo Spit. Bookmark the permalink.